Energy • Sufco hopes to extend life by 9 years tapping Greens Hollow in Sevier County, as Forest Service is finally ready to approve a long-delayed sale. 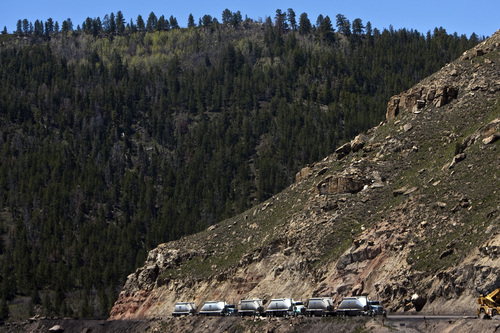 Chris Detrick | Tribune file photo Trucks line up to receive coal at Sufco Mine, which is seeking to tap the Greens Hollow tract on adjacent Forest Service land in Sevier County. The mine, Utah's longest operating and most prolific, needs to lease this tract, which would yield 57 million tons, to keep operating and feeding Emery County power plants. Chris Detrick | Tribune file photo Utah Governor Gary R. Herbert talks about the Sufco Mine in Emery Friday June 3, 2011. Coal has been mined continuously from the SUFCO mine since 1941. After two years of "supplemental" study, the U.S. Forest Service has issued a new environmental review of a proposed coal lease that could keep Utah&apos;s oldest and most productive mine operating for an additional nine years. The Sufco Mine has been pulling high-quality coal from under the southern Wasatch Plateau since 1941 and has been a crucial economic driver for Sevier and Emery counties. The mine operates on the Sevier side of the county line, about 30 miles southeast of Salina. The Greens Hollow lease is needed to feed the mine&apos;s future operations, which could otherwise run out of coal to mine as early as next year, according to the 415-page draft Environmental Impact Statement (EIS). "It&apos;s an extension of what we&apos;ve been doing versus shutting down," said Ken May, the mine&apos;s general manager. "It&apos;s perpetuating energy development and protecting jobs." The EIS looks favorably on pulling more coal from under Fishlake and Manti-LaSal national forests, but it proposes requiring the mine to take steps protect sage grouse habitat, water, roadless lands and other non-energy resources. It also proposes allowing only room-and-pillar mining over part of the lease area to protect perennial streams from subsidence associated with longwall mining, according to Marianne Orton, environmental coordinator for Fishlake National Forest. The Forest Service released the review Friday and opened a public comment period through April 28. The Greens Hollow project area covers 6,175 acres to the northwest of Sufco&apos;s current operations and would yield 56.6 million tons of coal, generating $194 million in royalties and tax revenues. Two years ago the Forest Service approved the lease, which would be administered by the Bureau of Land Management. But after environmentalists appealed, Fishlake&apos;s Forest Supervisor Allen Rowley withdrew the decision and initiated the supplemental review. Critics argued the first decision failed to adequately protect sage grouse, a candidate for listing as an endangered species, and roadless areas. Operations had already permanently reduced North Fork Box Creek, according to the Grand Canyon Trust&apos;s Mary O&apos;Brien. But May said his underground mine results in few surface impacts. "We are more concerned about the environment than anyone from outside the area," May said. "We live here and recreate here. We don&apos;t want to do anything to disrupt the local environment." A rich but dwindling seam • Sufco would access Greens Hollow coal from existing underground longwall operations that mine coal in sliced panels, tapping in new ventilation shafts as they progress. But May cautioned the lease would be subject to competitive bidding and another operator could win it. Sufco produces low-sulphur bituminous coal, most of which is burned in the 1,138-megawatt Hunter power plant in Castle Dale and two other plants in Carbon and Emery counties. 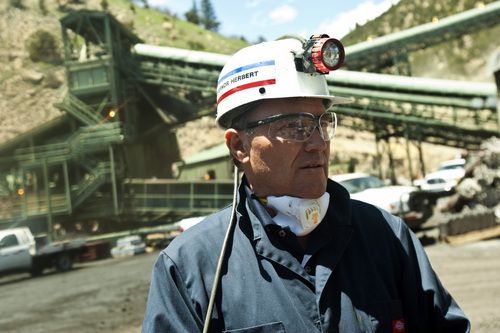 Rocky Mountain Power has contracted to purchase up to 4.5 million tons of Sufco coal a year through 2020, according to utility spokesman Dave Eskelsen. Over the past seven decades the mine has yielded 170 million tons from the Hiawatha coal bed. The seam, up to 14 feet thick, is part of the Blackhawk Formation, laid down in late Cretaceous Period 75 million years ago when fecund swamps covered what is now the Wasatch Plateau. Deep rich layers of peat accumulated in these bogs and was compressed into hydrocarbon deposits that pack more than 11,000 Btus per pound, according to David Tabet of the Utah Geological Survey. A British thermal unit is the amount of energy needed to heat a pound of water by one degree Fahrenheit. Sufco has long worked a continuous, flat seam not too far beneath the surface that made for ideal mining conditions. "They are the highest producer because their coal was thick and more uniform. They could use longwall panels that they wouldn&apos;t have to move as often," Tabet said. But operations are now stepping down into the lower bed, where mining conditions are trickier and the coal is not as a pure or rich in energy. This is because it formed not in the center of the swamps, but closer to their edges, where streams disgorged sediments that mixed in with the organic material, Tarbet said. Not only does the coal pack less energy and more ash, but it lies deeper underground, up to 2,500 feet deep at the western end of the Greens Hollow tract. Indeed, Sufco has struggled in recent years to supply coal with sufficient Btu content to satisfy the needs of its biggest customer, triggering a lawsuit filed by Rocky Mountain Power then settled out of court. Coal&apos;s unclear future • Last year Sufco, which employs 363 people, produced nearly 6 million tons, nearly 36 percent of Utah&apos;s output from eight mines. But its production has declined by 2 million tons in the last few years, following a statewide trend in the face of faltering demand, according to the Utah Geological Survey&apos;s 2013 annual report. "Existing Utah mines face steady reserve depletion and difficult mining conditions," Tabet and his colleagues wrote. "In addition, the demand for Utah coal has sharply decreased over the past few years as power plants have switched to natural gas over coal-fired generation." While federal policy accommodates extraction of publicly owned coal to serve the nation&apos;s energy needs, the environmental community is pushing back because of coal&apos;s propensity to pollute the air and release climate-altering gasses when it&apos;s burned. Natural gas burns more cleanly and releases half the carbon dioxide per kilowatt generated. "They know those local contracts are good now but the future of coal power generation is pretty iffy right now," said Jeremy Nichols, WildEarth Guardians&apos; energy program director. "It&apos;s last gasp is to look to the export market." Despite environmental concerns, Utah&apos;s political leadership has pledged to support coal production and agencies are studying ways to strengthen markets. Last fall the state completed the long-anticipated Quitchupah Creek road connecting the Sufco mine with State Route 10 a few miles south of Emery. This 11-mile road cuts haul distances for up to 250 trucks a day to the Hunter power plant by 46 miles. That road&apos;s $30 million cost was covered by the state&apos;s Permanent Community Impact Fund, which distributes revenue from federal mineral leases to build roads, water projects, sewer and other infrastructure in rural areas that accommodate energy production. The Forest Service is now conducting a separate analysis on Sufco&apos;s request to expand its permit area by 19 acres along the Quitchupah road where it wants to develop crushing, loading, storage, blending and other facilities for handling coal. This proposed federal coal lease would make about 56 million tons available for extraction to the northwest of the Sufco Mine in Sevier County.